Post 8870’s teacher of the year was also named the District 1 Elementary teacher of the year at the District awards meeting on January 5. Devon Ames, who teaches 5th grade at Serene Lake Elementary in Mukilteo Received her award certificate and moves on to represent Post 8870 and District 1 as our nominee for the Department of Washington award which will be announced officially at the Mid Winter Conference in Yakima later this month. 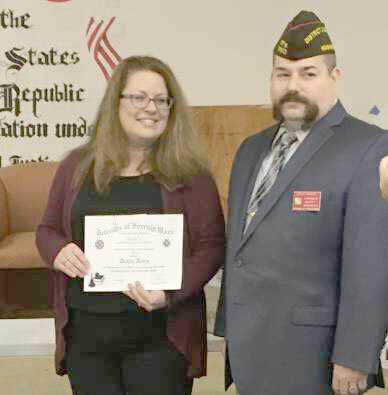 Devon is shown above receiving her certificate from District Commander Doug White.